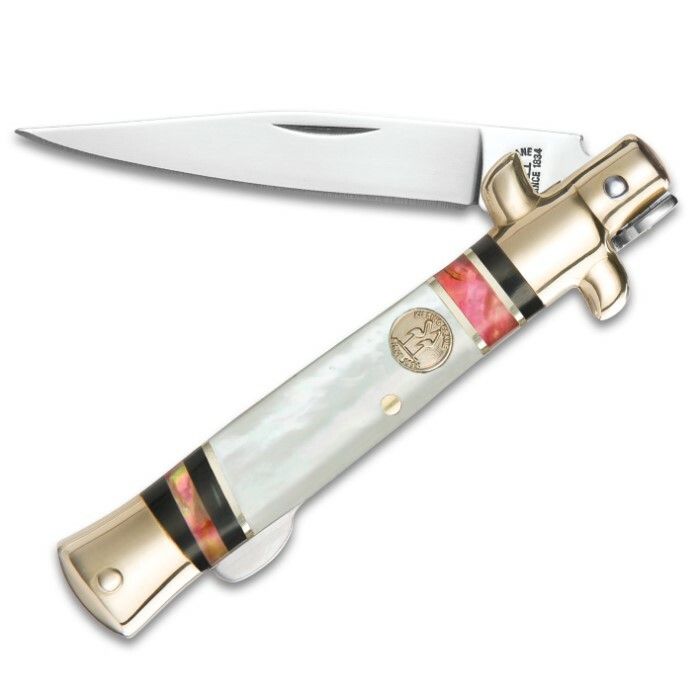 Kissing Crane Pastel Firestorm Handcrafted Stiletto Pocket Knife - 440 Stainless Steel - Genuine Mother of Pearl, Pink Abalone - Brass Bolsters - Fully Functional, Collectible - 4" Closed | BUDK.com - Knives & Swords At The Lowest Prices! 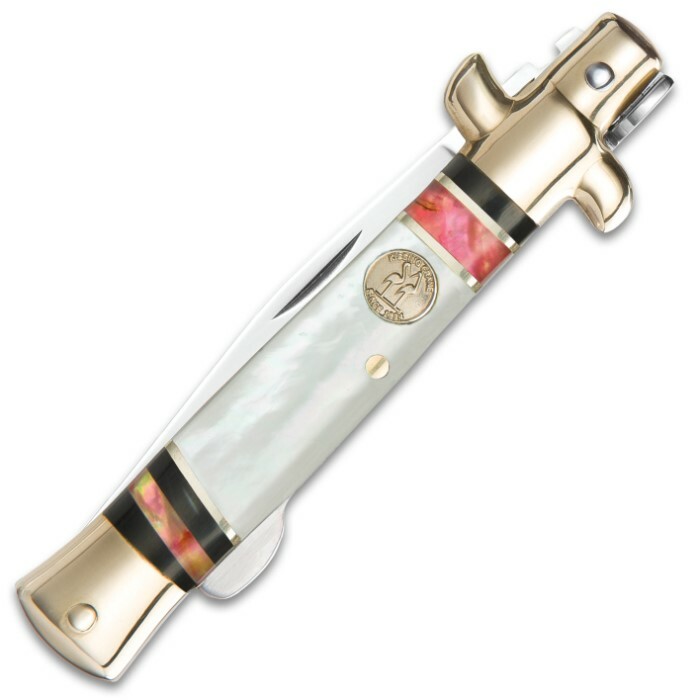 Kissing Crane's "Pastel Firestorm" Stiletto Knife is a breathtaking kaleidoscope of sparkling light and vibrant color. 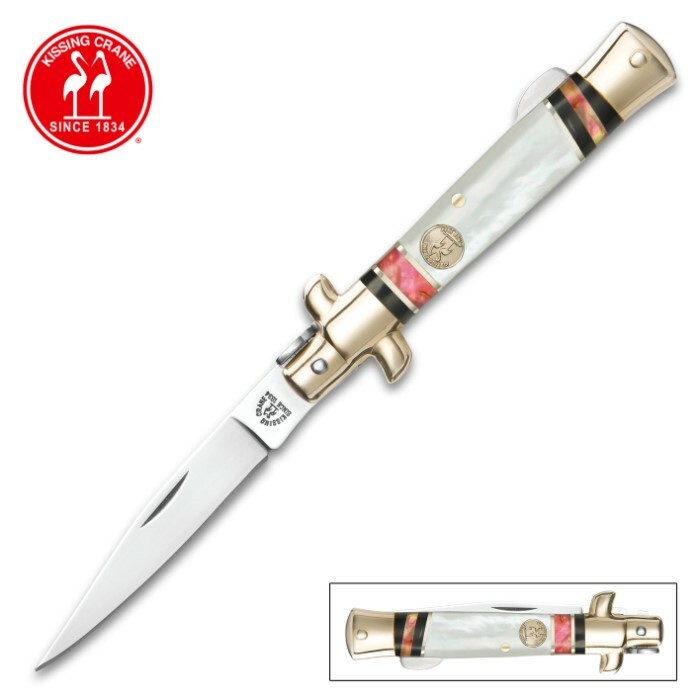 Hand-set mother of pearl and pink abalone handle scales radiate and flash with opalescent fury when turned under light, and stately brass bolsters beam with hand-polished luster. This unique folder is truly a collector's dream - perfect for display. But it's also field-capable and potent, with its razor sharp 3" 440 stainless steel blade and sturdy lockback mechanism. Regardless of how you choose to enjoy it, rest assured the Pastel Firestorm is in it for the long haul, backed by more than 150 years of world class knife-making quality. Supplies are extremely limited, so get yours before these bladed treasures are gone forever! Another beauty from KC. As usual the blade, scales, bolsters, liners, and back spring are perfectly finished. The mother of pearl really pops in the light. Accented by Abalone, brass and black make this one beautiful knife. This style blade is more suited to an EDC then the traditional bayonet or dagger style usually found on a stiletto. Collector or not this is a winner, and the 3in blade is legal everywhere.